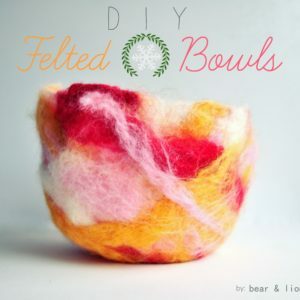 last week i pulled out my box of felt and got busy with several different projects! 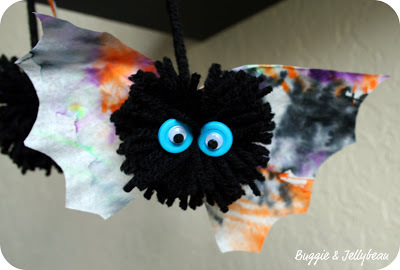 today i am sharing a halloween craft, which seems fitting as halloween is coming quickly this coming weekend! 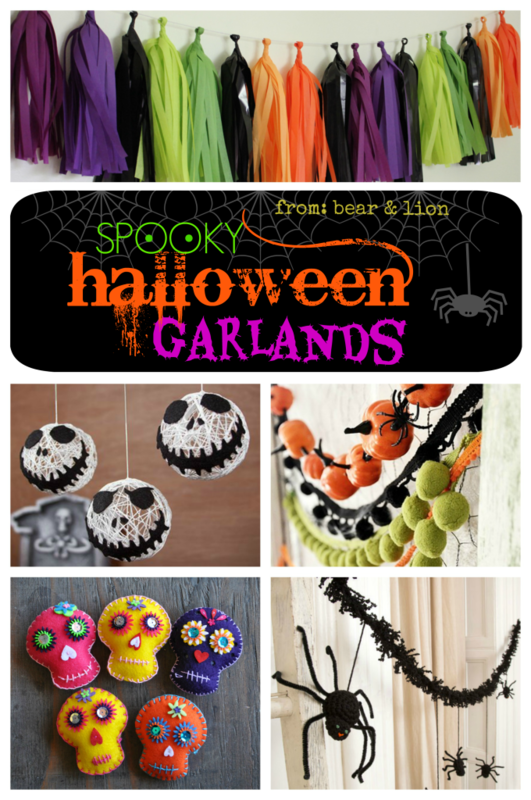 do you have all of your costumes organized and ready for trick-or-treating? 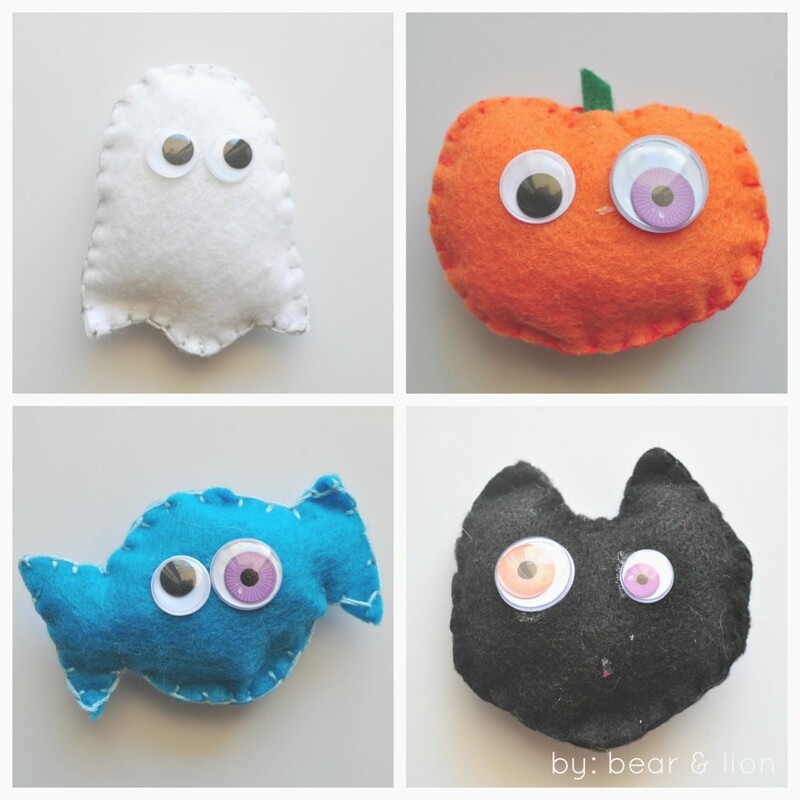 aren’t these googly-eyed halloween characters adorable? 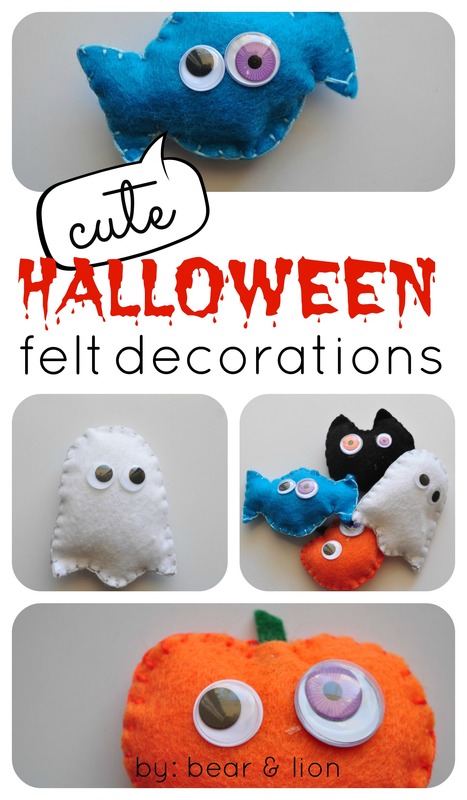 i made these wee adorable halloween felt decorations. 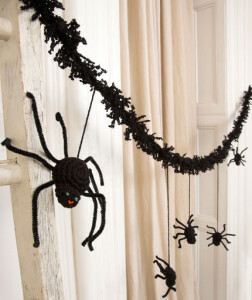 i thought some people may want to add string or ribbon to them in order to hang them or make a spooky mobile. 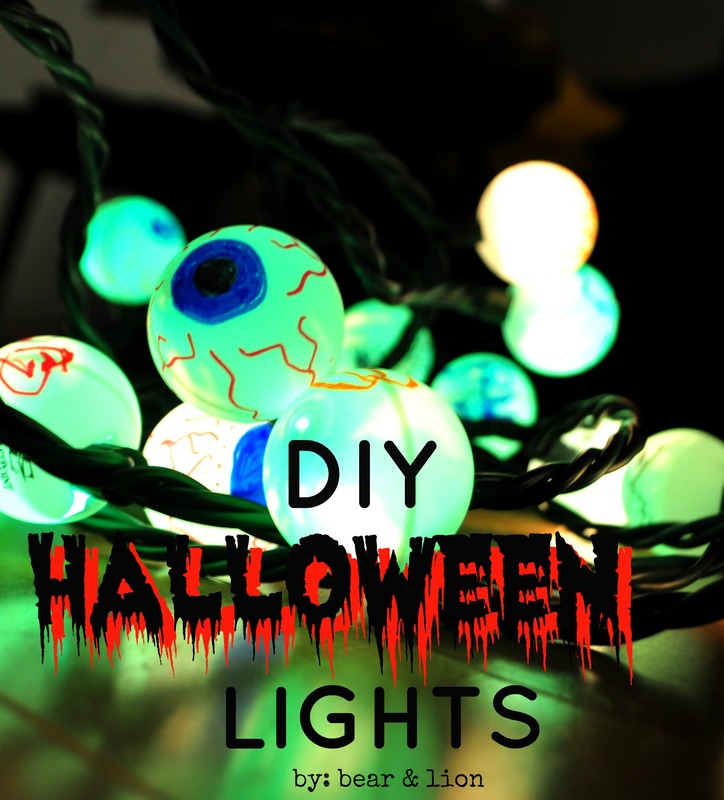 i personally left them as is, and have popped them on windowsills and flower pots peeking their googly eyes around the leaves. 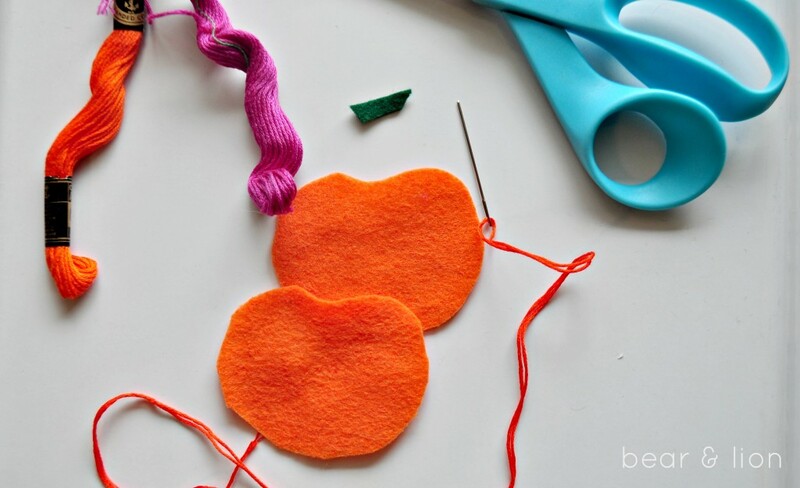 fold your felt so you cut two identical pieces. 2. thread your needle and sew the two pieces of felt together using a blanket stitch. leave a small space for stuffing filling. 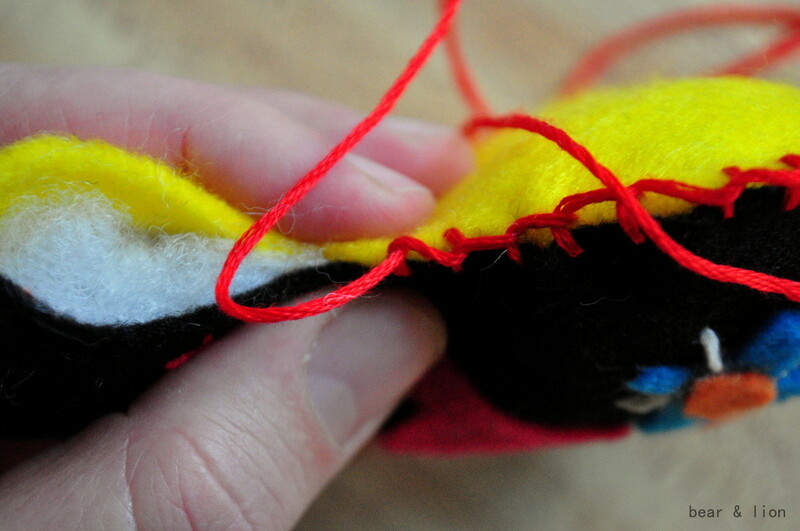 3. once you have stuffed enough stuffing keep sewing your blanket stitch. 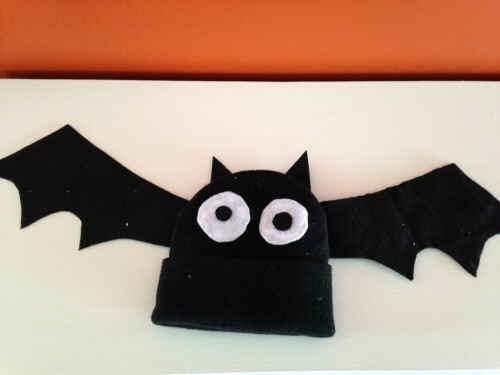 4. hot glue gun the googly eyes onto the felt. 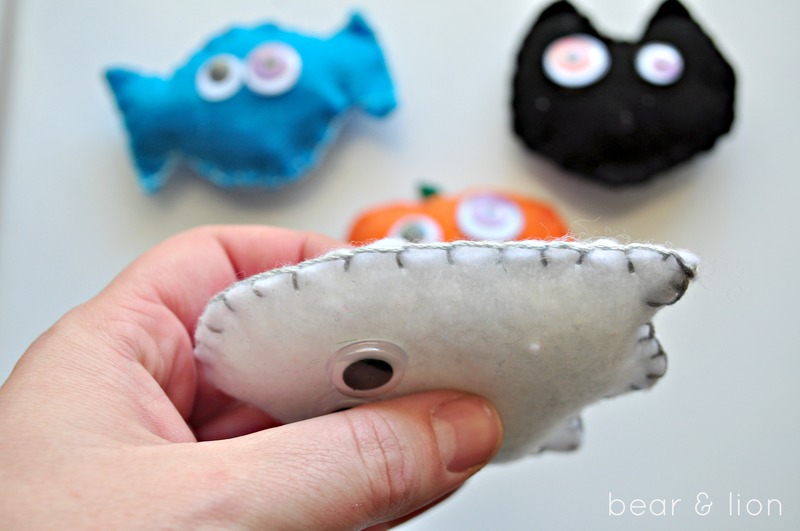 these googly-eyes halloween cuties aren’t particularly spooky, but are super fun nonetheless. 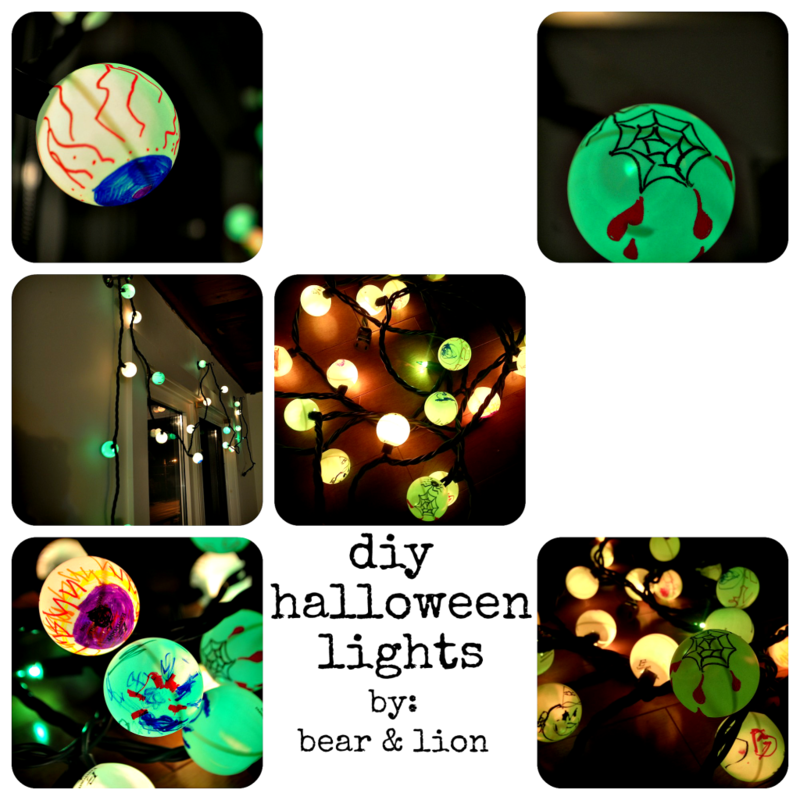 now, i gotta get lion’s halloween costume organized. he’s a minion (as are so many other kids!) 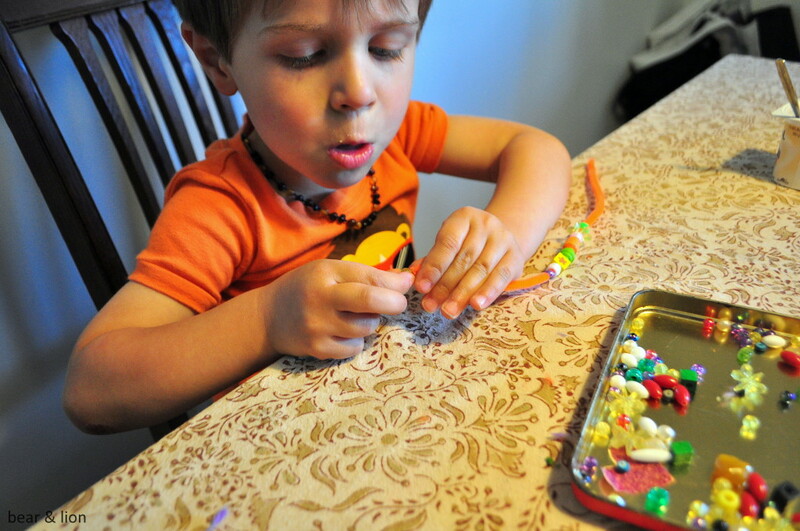 so i’m using mason jar lids to make his goggles! should work out well, i think! bear has worked hard at his wizard costume independently, which has been really fun to watch. he clearly has some specific ideas he wants to bring into fruition! i will share pictures as we get more organized! 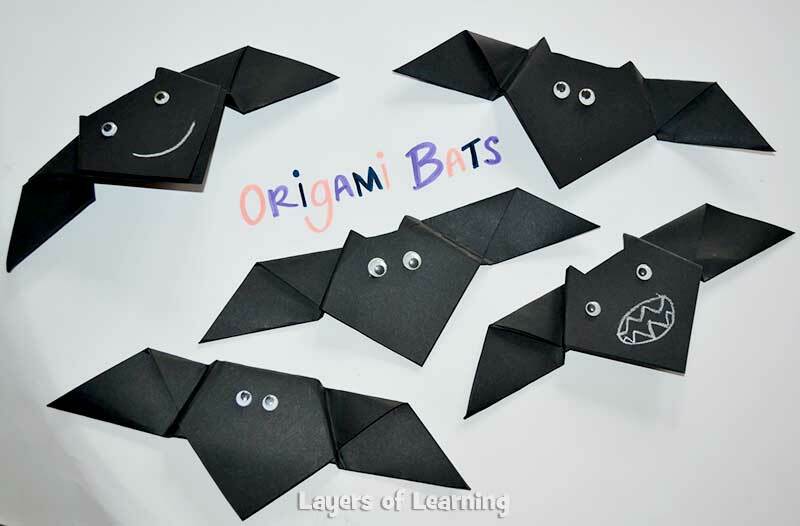 this BATTY round-up of bat crafts is intended for slightly older school aged kids. 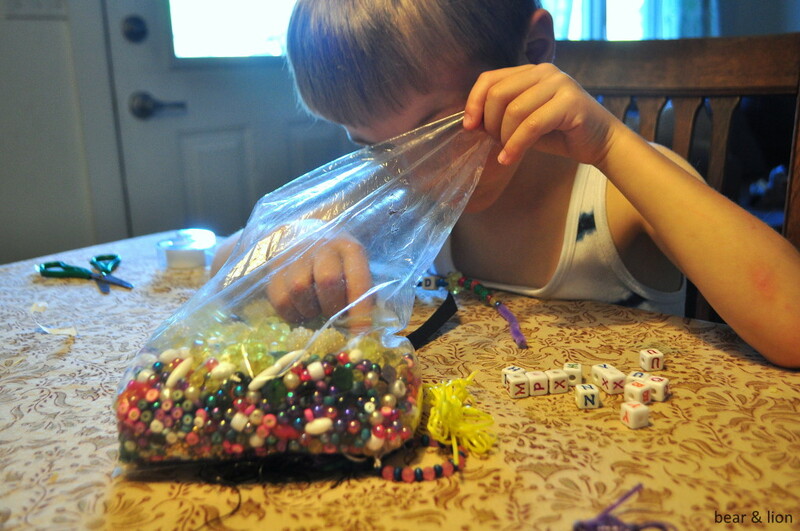 my kids, 5 and 7 love to get crafty and are often looking for slightly more challenging projects to get involved in. the brooch is actually an adult craft, but i thought with some adult assistance a kid could absolutely sew an adorable bat brooch! right?! 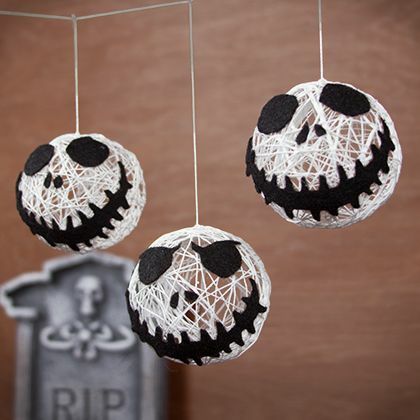 halloween is a month away and it’s time to decorate, a little at least! 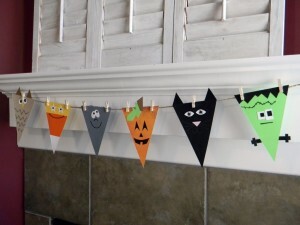 we’re not going to do too much outside this year as the road in front of our house is under major construction, but we will definitely put some fun decorations up inside. kitten friendly ones of course, leo our wee one is always jumping after anything and everything that hangs! haha! 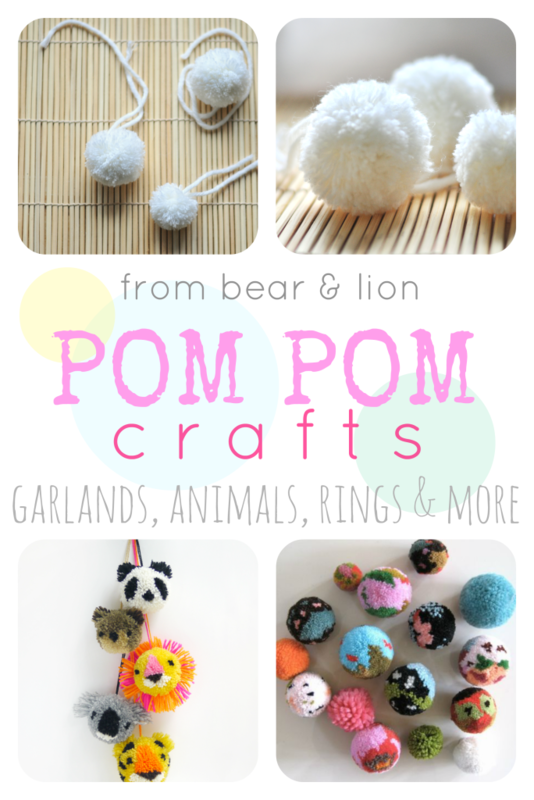 ok, so here are the pictures and sources to each craft! aren’t they just battyest ever! hope everyone is enjoying this transition to fall. the weather has finally cooled and the air is crisp with fall! 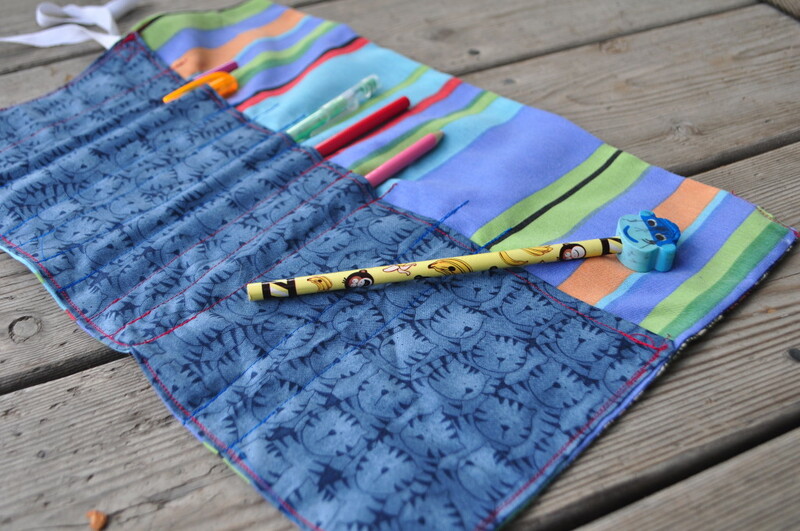 back-to-school : sew your own pencil roll-up case! school for my boys starts tomorrow!!! it’s hard to believe summer is over, even though at times i was feeling quite burnt out and tired. my boys are ready to go back to school, see their friends and meet their teachers. i am ready for them to return, as well. 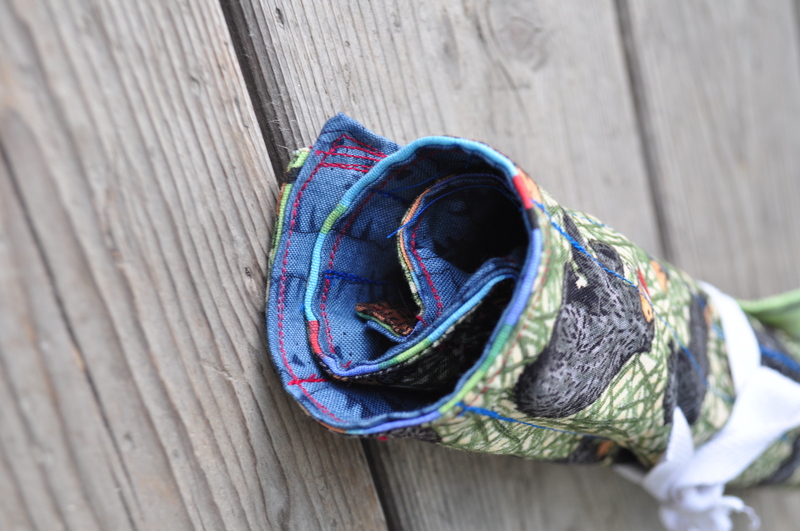 my bear told me he needed a pencil case as he enters grade 2. i thought that sounded quite reasonable, so i decided to sew up something fun for him, instead of buying one. 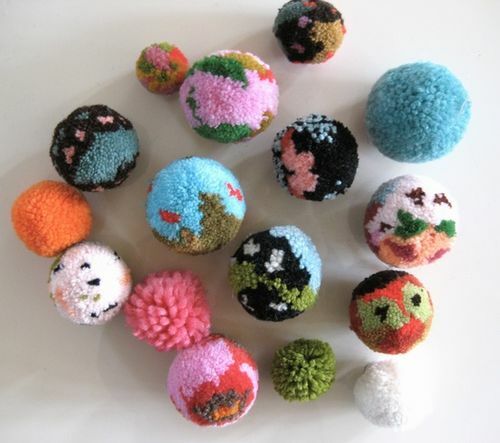 and, of course i had to search for some design and sewing ideas!!! 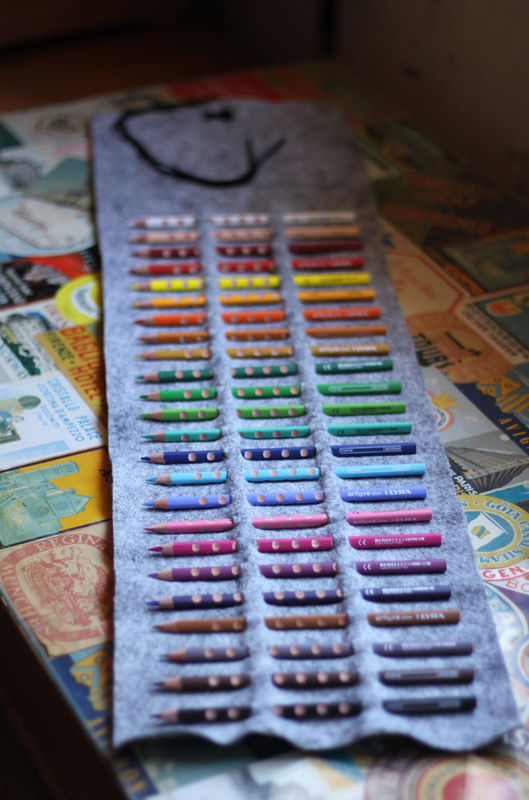 here are some roll up pencil cases i used as inspiration for my own design. 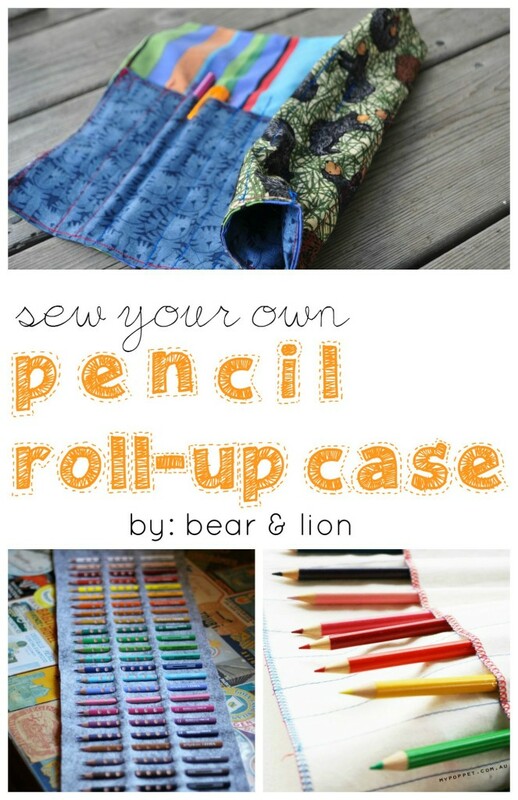 these bloggers have shared fantastic pictures and tutorials for this sewing project so i will spare you my horrid instructions. 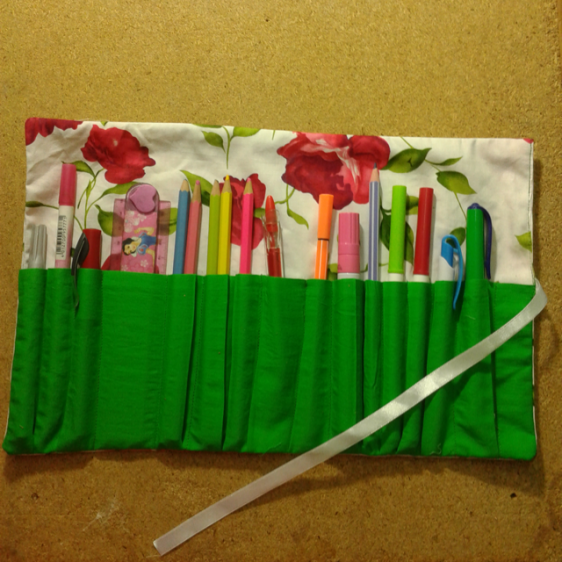 i will say this that to sew up bear’s pencil case took about 90 minutes from start to finish. 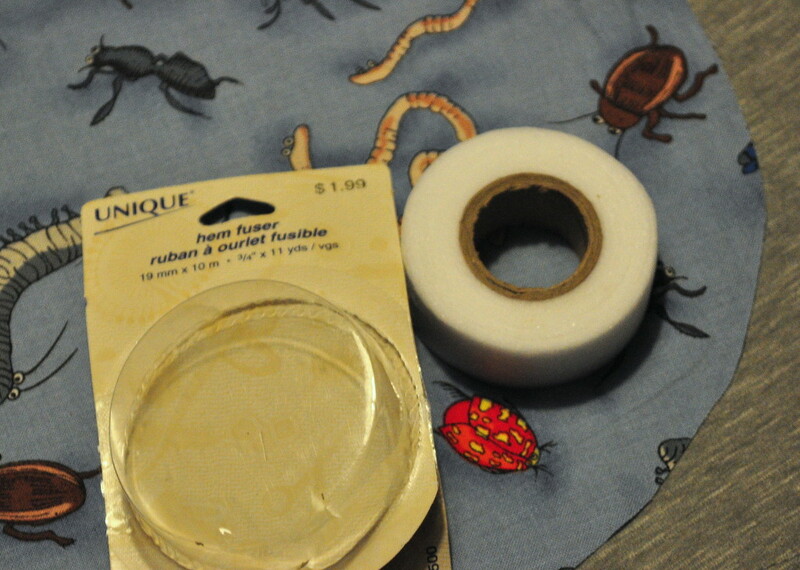 that includes finding fabric in my basement, ironing, filling my bobbins and fixing some mistakes. 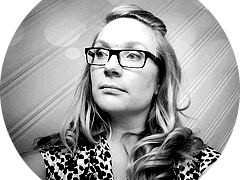 all-in-all it’s not a very difficult project! 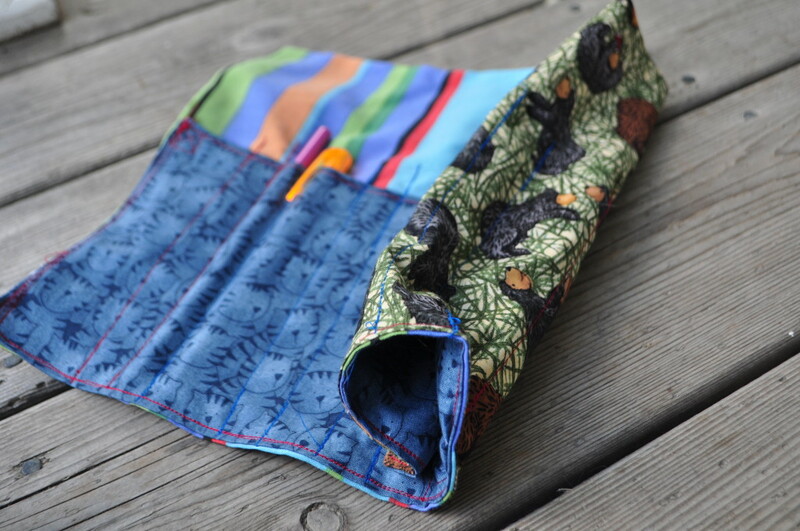 bear’s pencil roll-up case was a surprise and he was thrilled with it when i showed it to him. 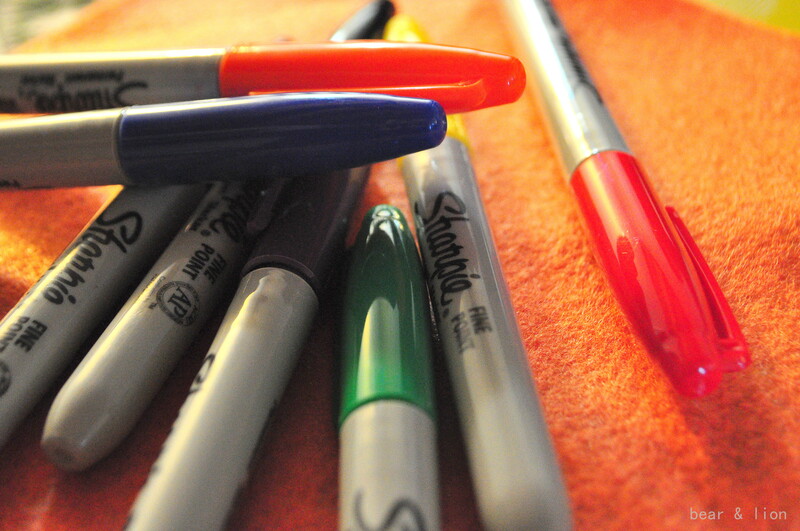 he immediately went to the art room and chose which supplies he needed. it was pretty sweet watching him kiss it! haha! 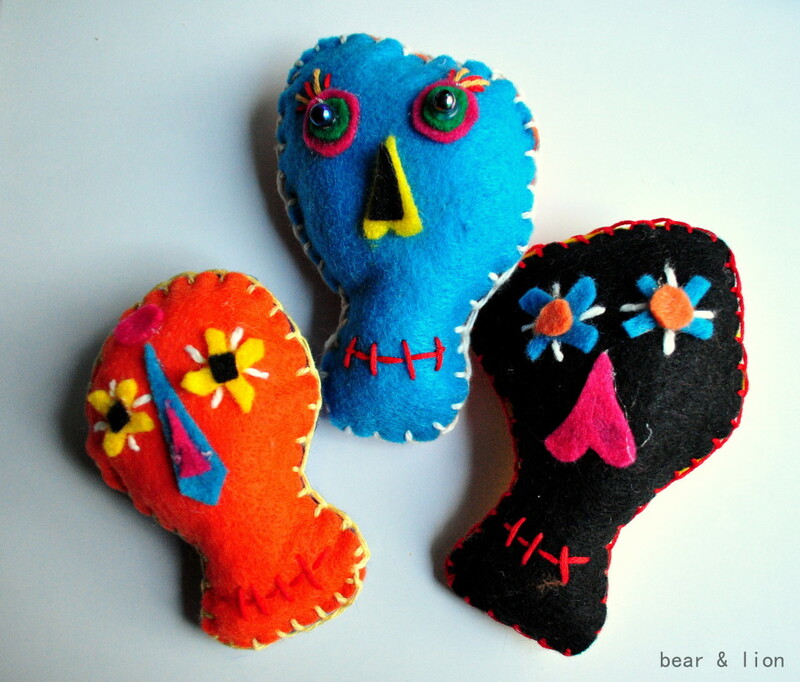 day of the dead felt craft. 1. cut out the skull shapes. i chose to just cut them free hand deciding to do the front and back in different colours. i liked the way a more asymmetrical skull looked vs. a symmetrical one. 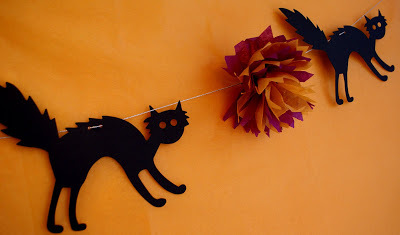 2. then i just started cutting shapes out of other colours of felt. an upside down heart makes for a great nose! once i liked the way something looked i used a glue gun to stick them to the skulls. then i stitched the mouths on. 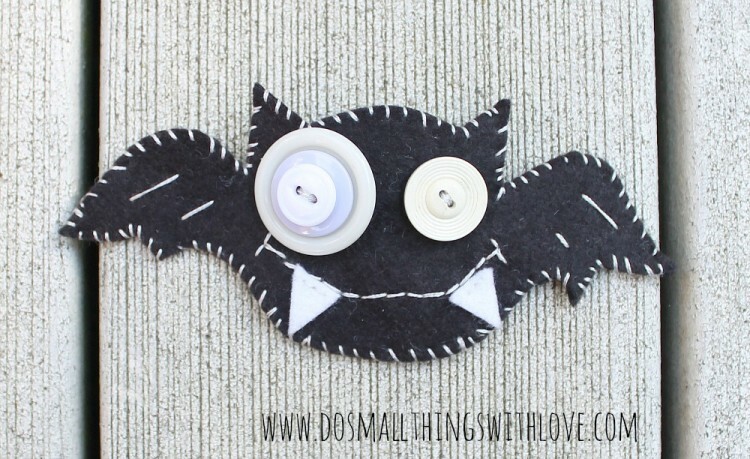 3. sew the two sides together using a blanket stitch. 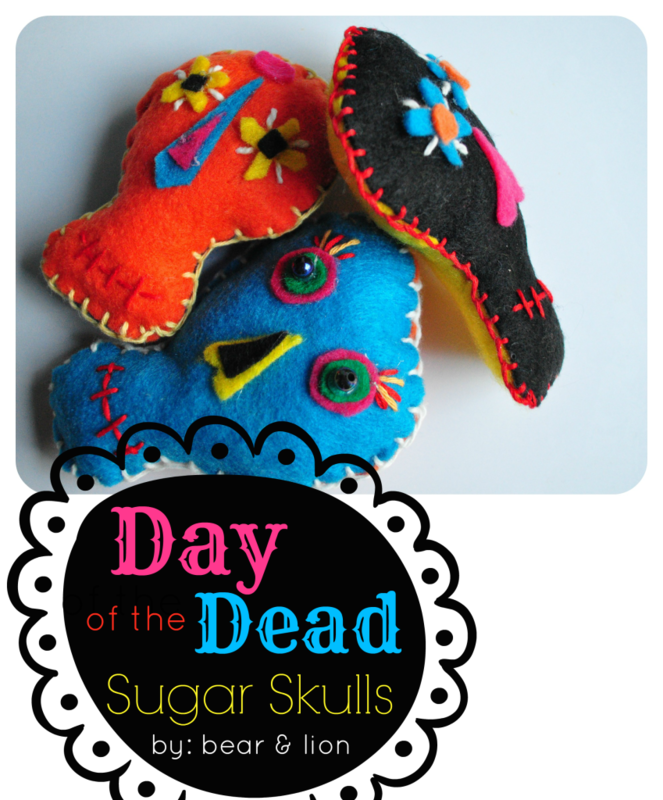 leave a small opening to fill the sugar skulls with stuffing and then continue stitching. 4. voilà! 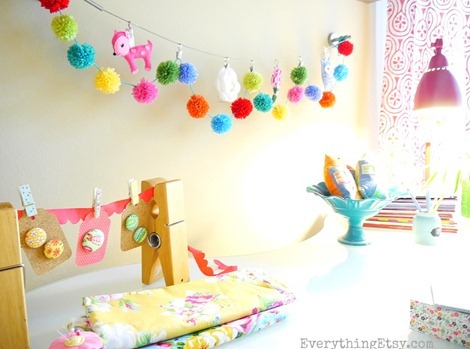 such fun and colourful decorations! i’m super pleased with them! each sugar skull took about 30 minutes to make. 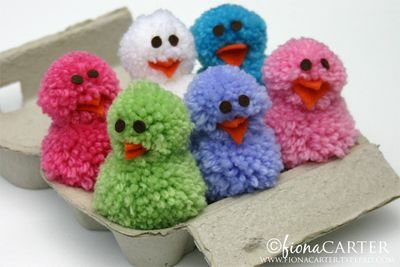 i’ll be making a few more and then making a garland out of all of them! here’s some of my favourite places where i found inspiration : casa artelexia made those colourful sugar skulls with sequence eyes, pear mama made those awesome potato stamped tea towels and alisa burke painted the gorgeous, detailed rocks! 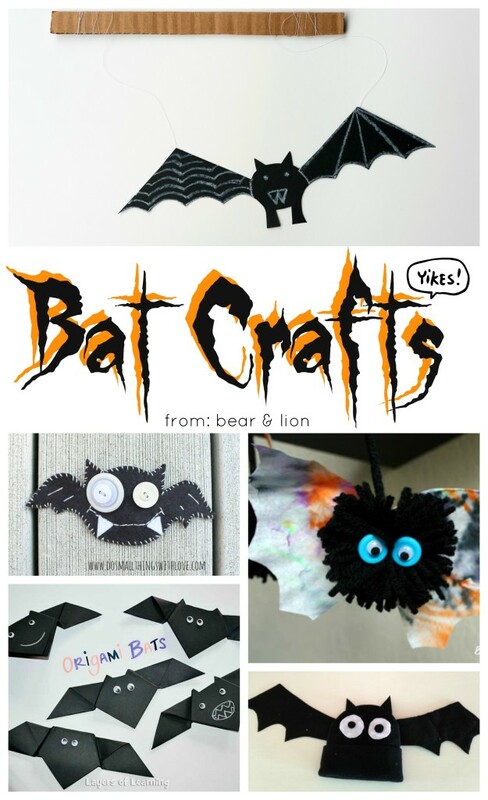 it’s time to think of halloween and get crafty! 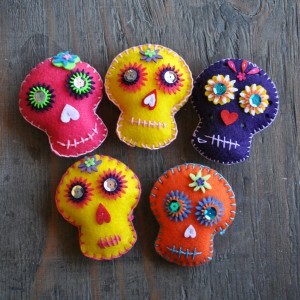 i am going through a bit of a day of the dead phase; googling images and projects with the theme. 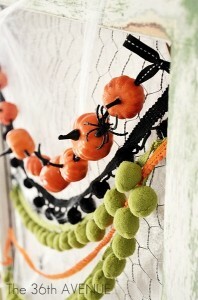 i think this fall i will try to make a felt skull garland. 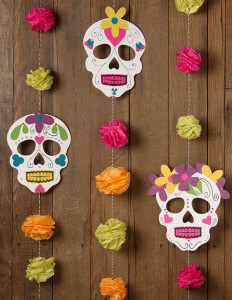 i just love the bright colours, patterns and the combination of flowers and skulls! 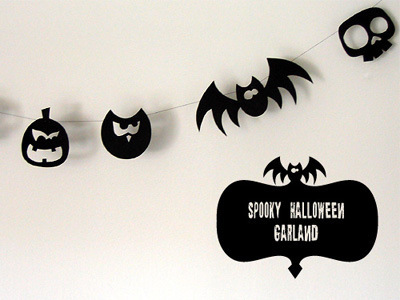 which garland is your favourite? october starts next week! WHAT?! 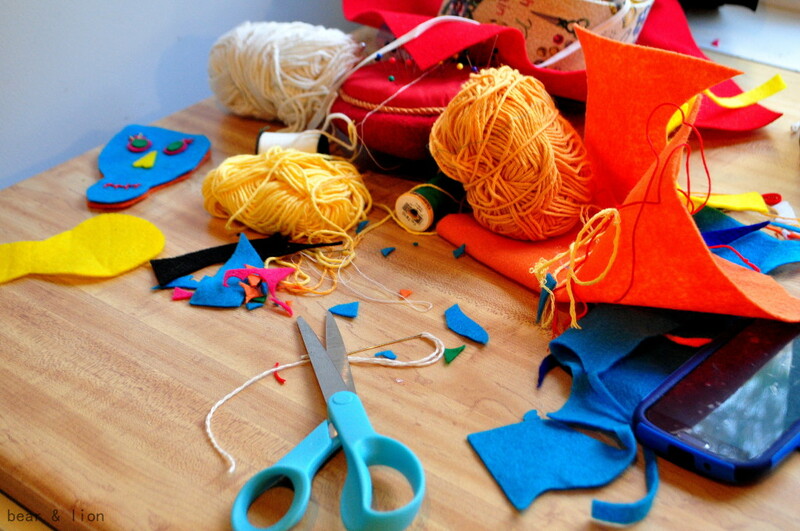 it’s true, so let’s get brainstorming, plug in those glue guns and get crafting! 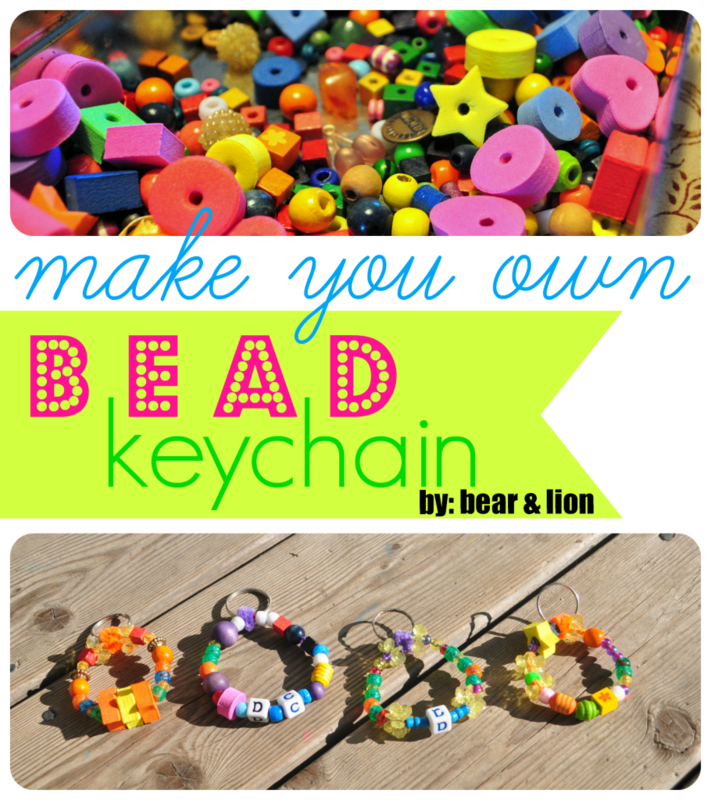 make your own bead keychains! 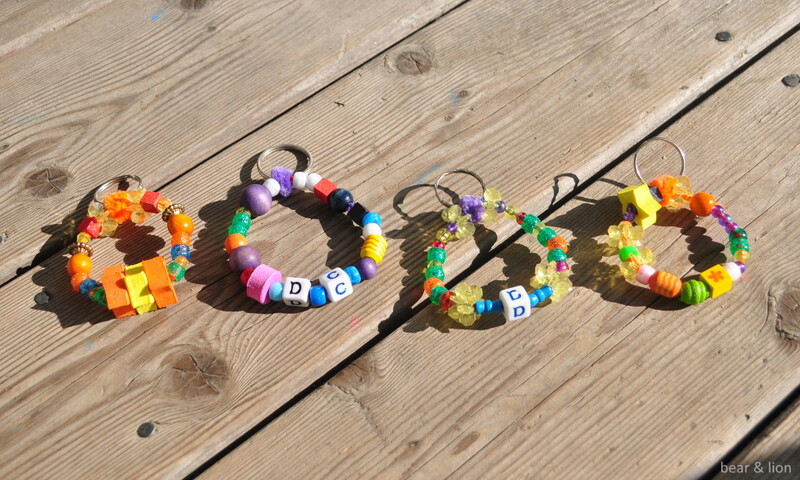 for father’s day the kids made these awesome keychains for their grandfather’s. 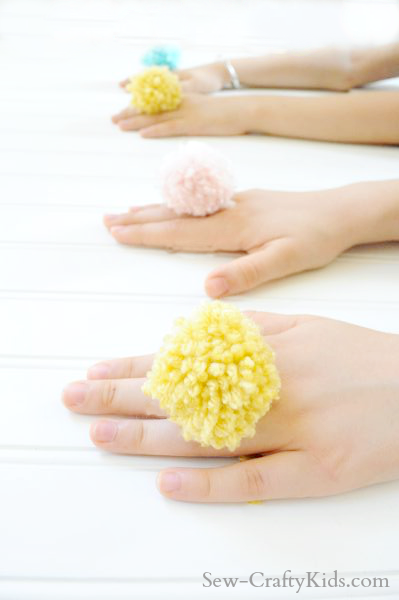 all they used were various sized beads, pipe cleaner and a metal ring. 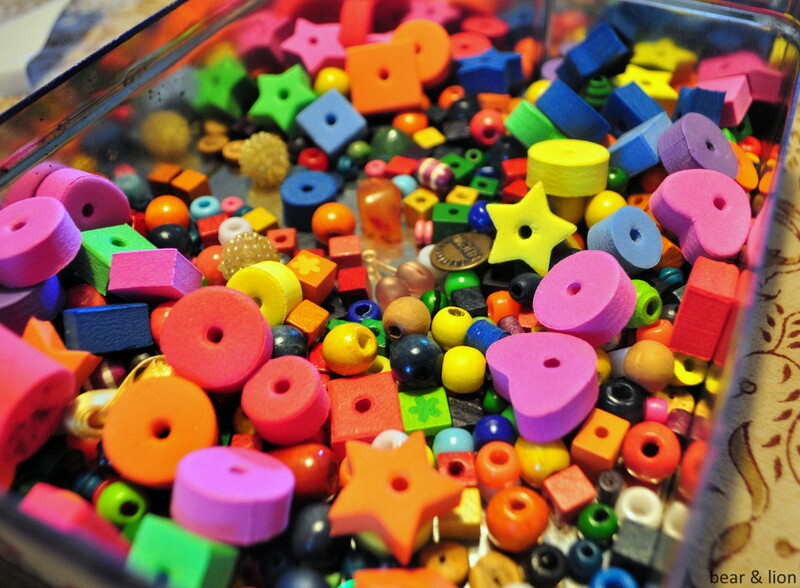 we have purchased beads from all kinds of sources like thrift stores and garage sales, which tend to have wonderfully strange beads in the mix for a low, low price! 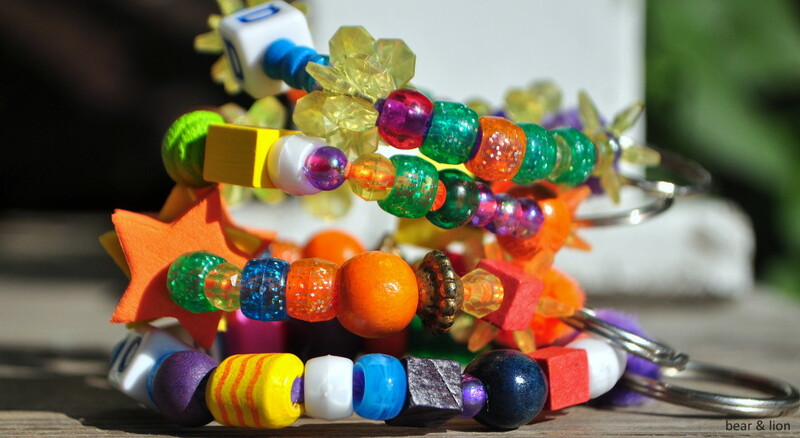 the kids created all sorts of different patterns with the beads. 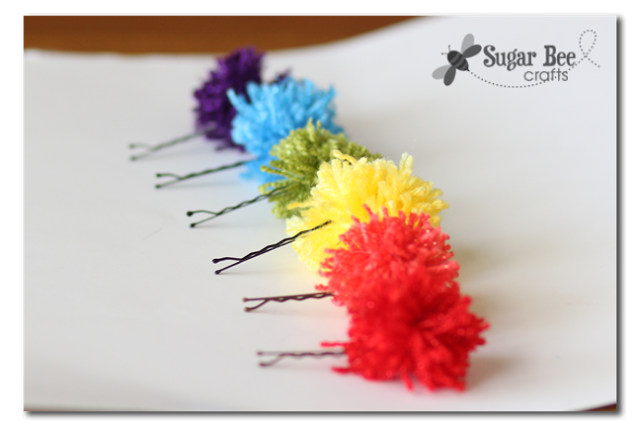 once they were finished beading, we wound the two ends of the pipe cleaner tightly around the metal ring. 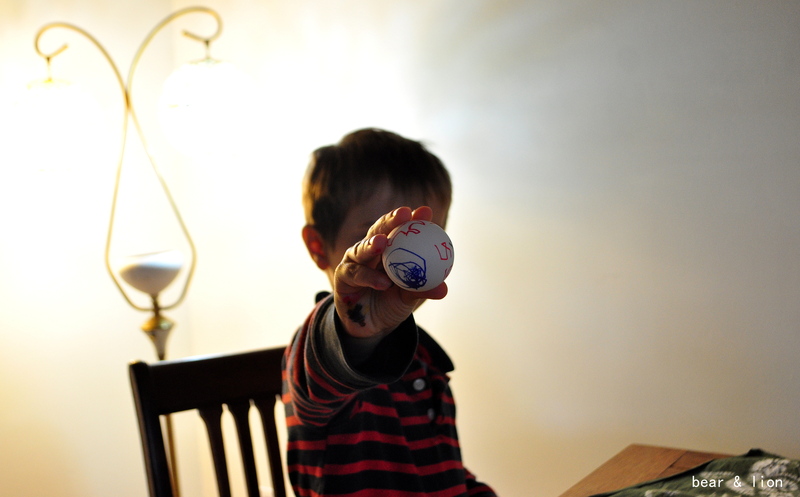 i think it’s good for an adult to do this part to ensure the ends are attached tightly. 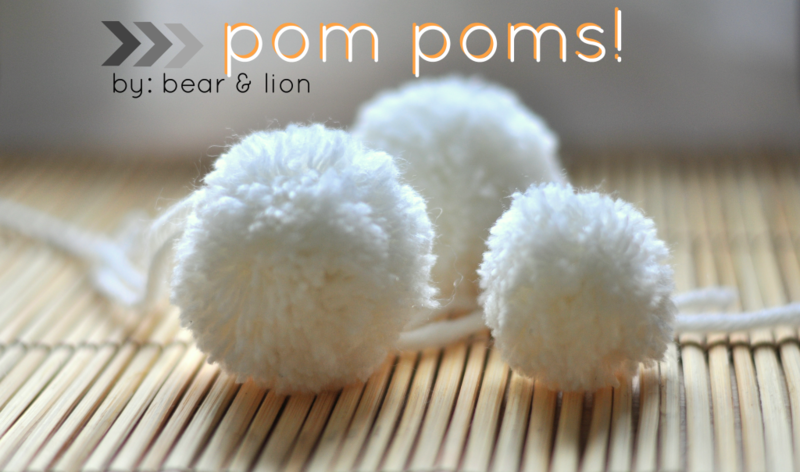 the grandfathers loved them… OF COURSE!!! 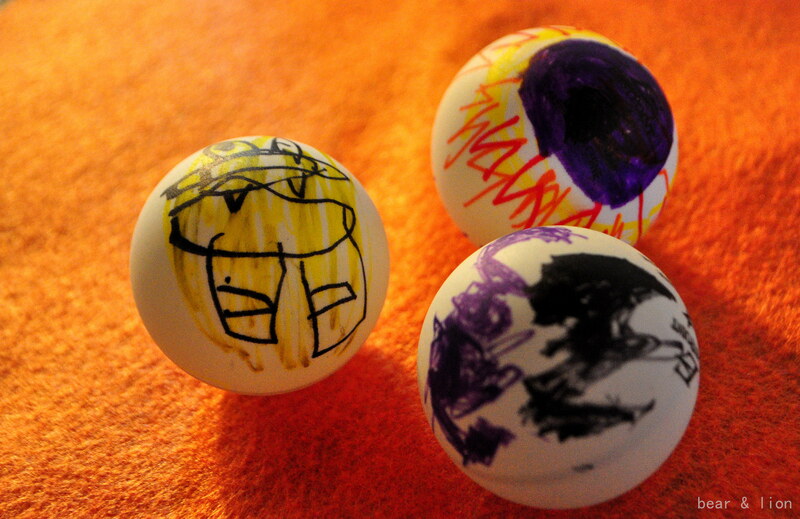 making these took only a short time. 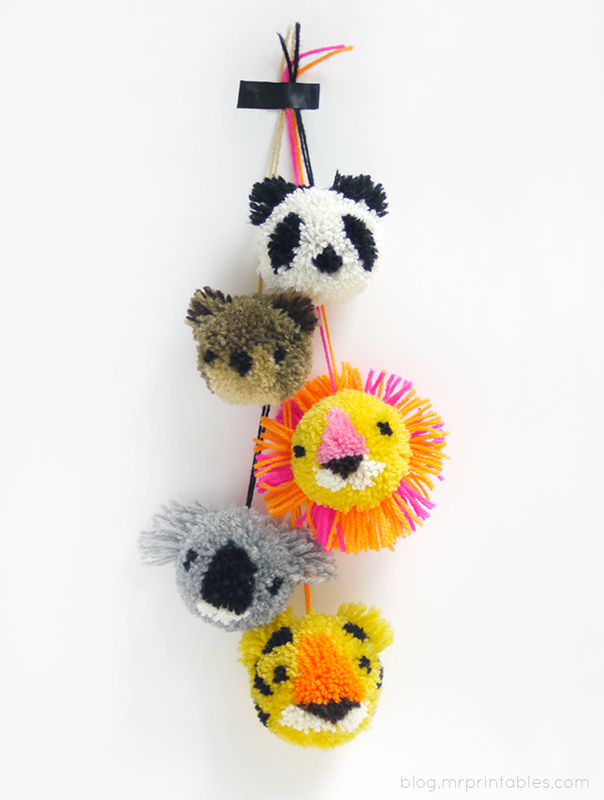 these colourful keychains are a perfect gift idea for anyone! and, they could make perfect zipper tags as well! 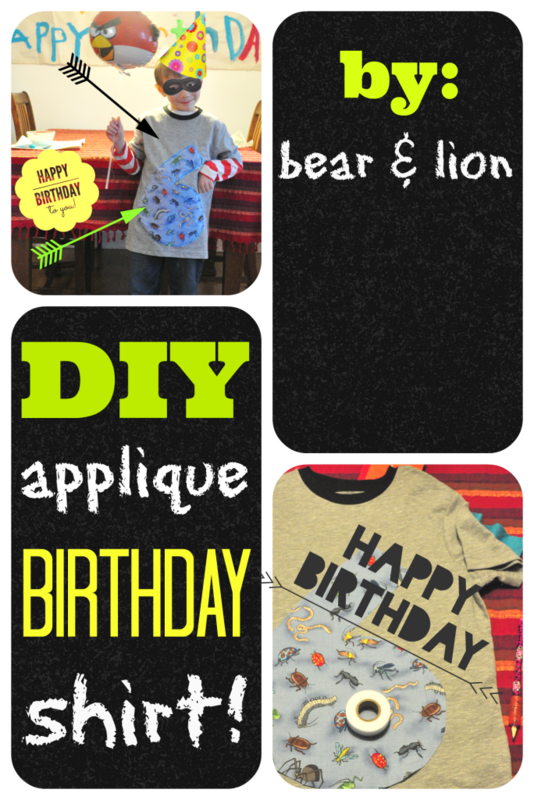 my bear turned 6 in february, so i made him this fun applique shirt. i bought a plain t-shirt for $5, found some fabric i thought he would like and then the night before his birthdy quickly sewed up the shirt. 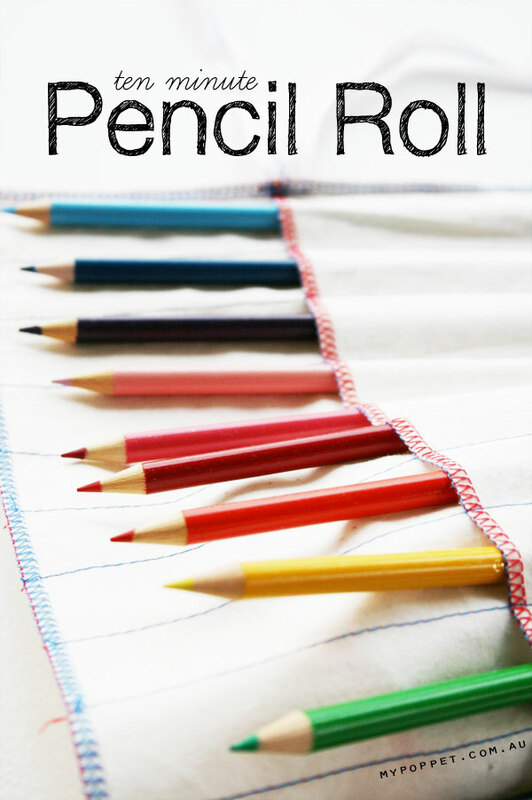 1. iron the t-shirt and the fabric you will be working with. 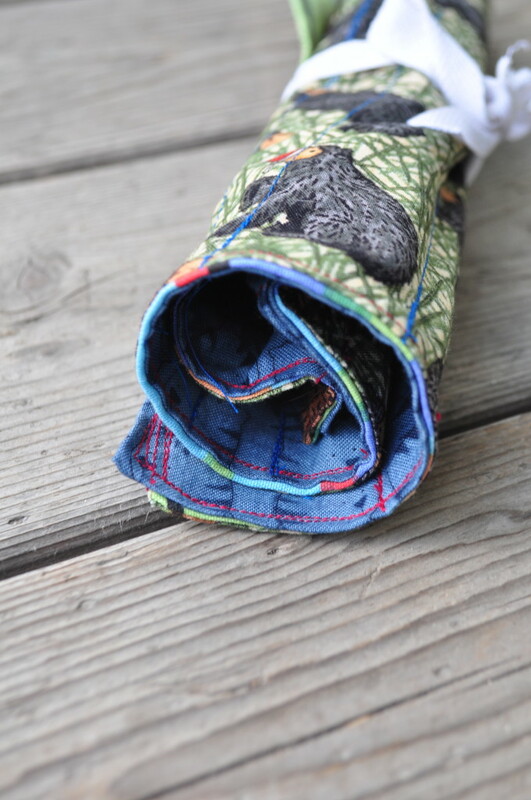 it is easier to work with flat fabric, plus your finished product will look that much better! leave your iron on, as you will need it later in the third step. 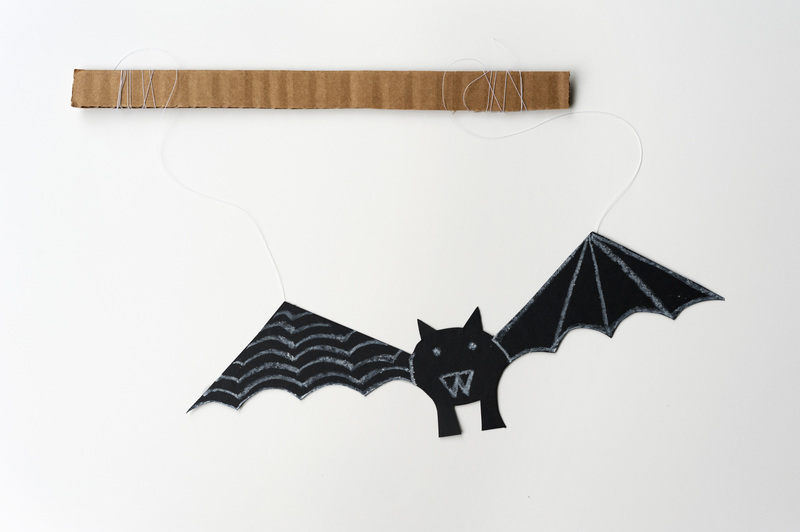 2. draw the number on your fun fabric lightly with a pencil, then cut it out. pin it on to your shirt. 3. make sure your iron is still hot. 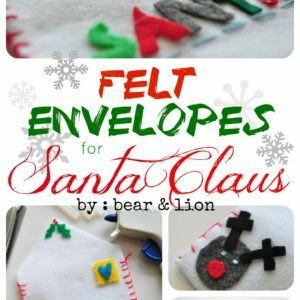 before using the hem fuser, read the insructions on the package. 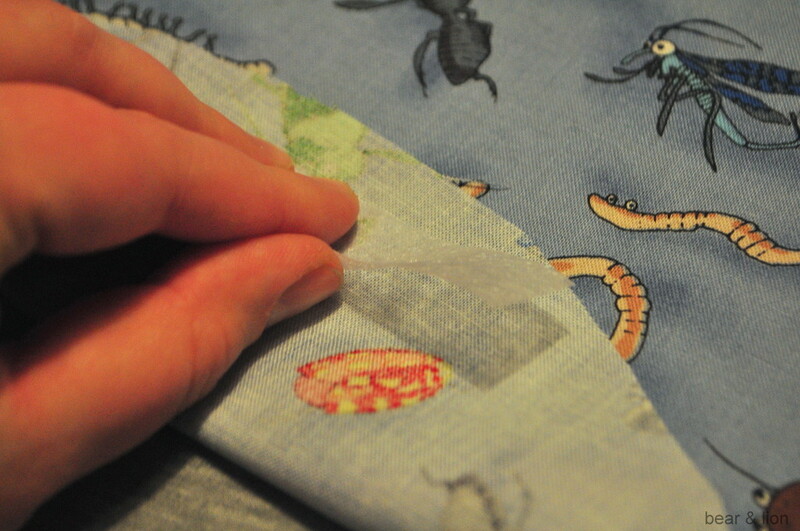 cut the hem fuser into strips and carefully place them around the edge of your number. because, a 6 has so many curves i had to cut lots of small pieces to get around around the bends. i did leave some spaces between the strips to allow for flexibility. 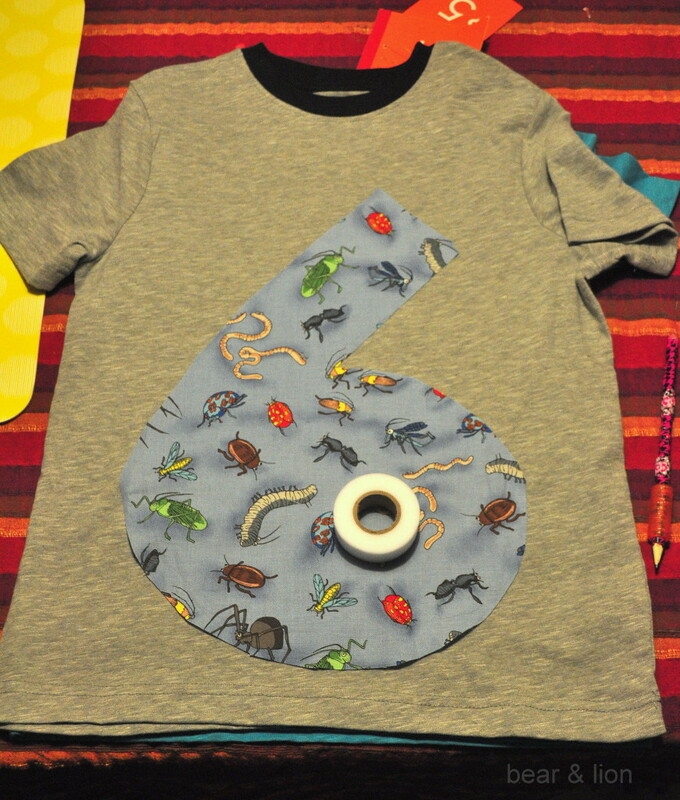 4. once the number is fused to the t-shirt, with your sewing machine sew around the edges of the number. i sewed around three ties. 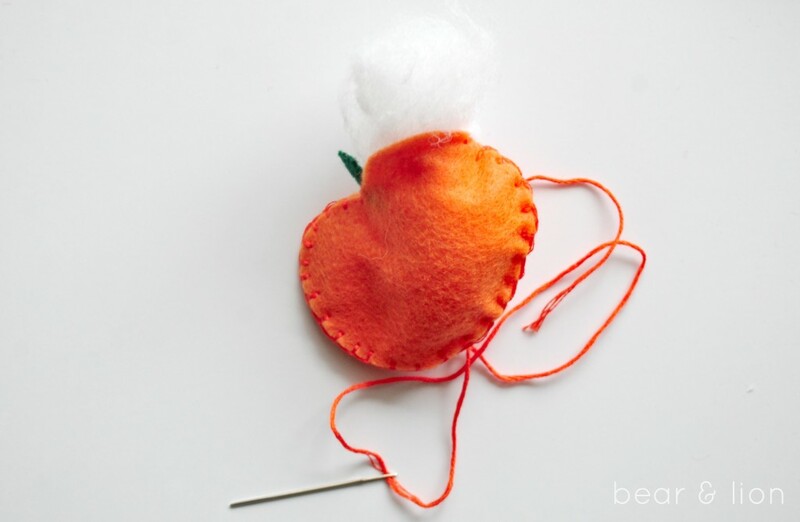 it doesn’t mater what stitch you use. 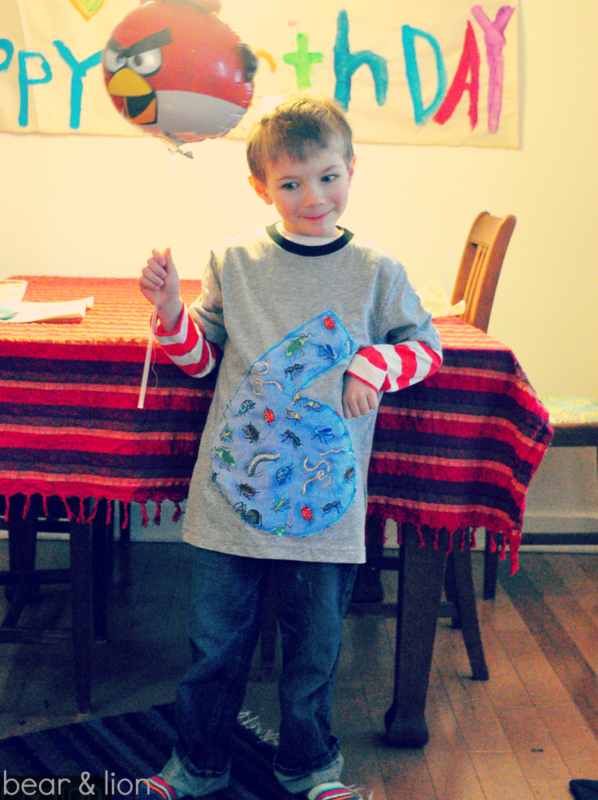 i didn’t care about sewing it perfectly, opting more for a rougher look, which i think is perfect for this 6 year old’s bug applique birthday shirt! 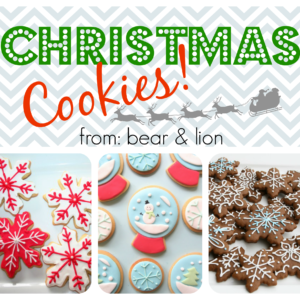 and, he LOVED it! bear has received lots of compliments on this personalized shirt! 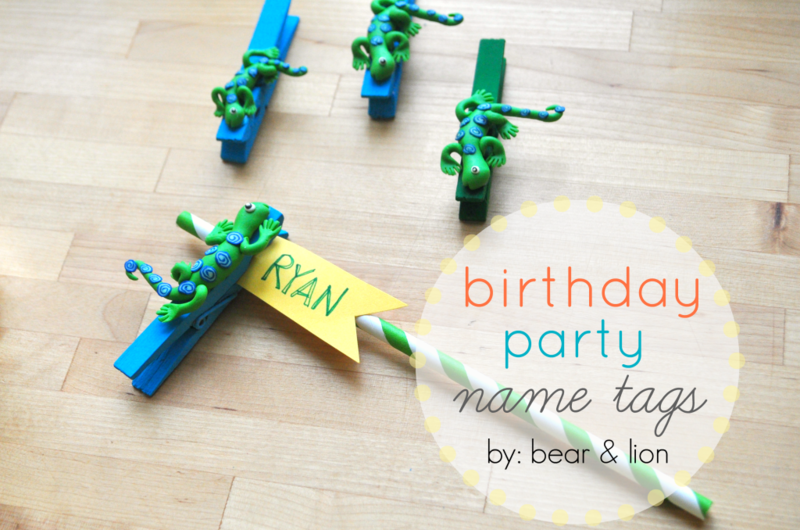 bear has asked for a dinosaur themed birthday! for this craft i couldn’t actually find any wee dinosaurs, but i found these cute lizards for 99 cents a pack and i thought they were close enough! 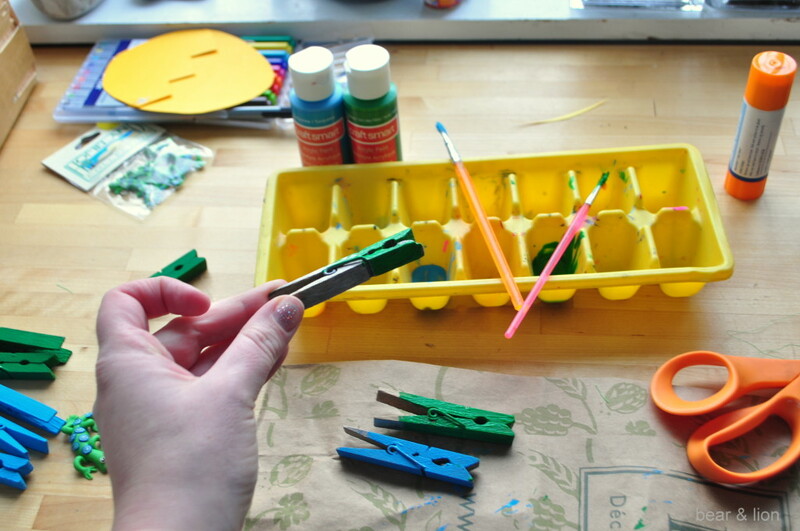 here’s what i did… first, i painted the clothes pegs with acrylic paint. i had to do a couple of coats to achieve a nice, solid, bold colour. 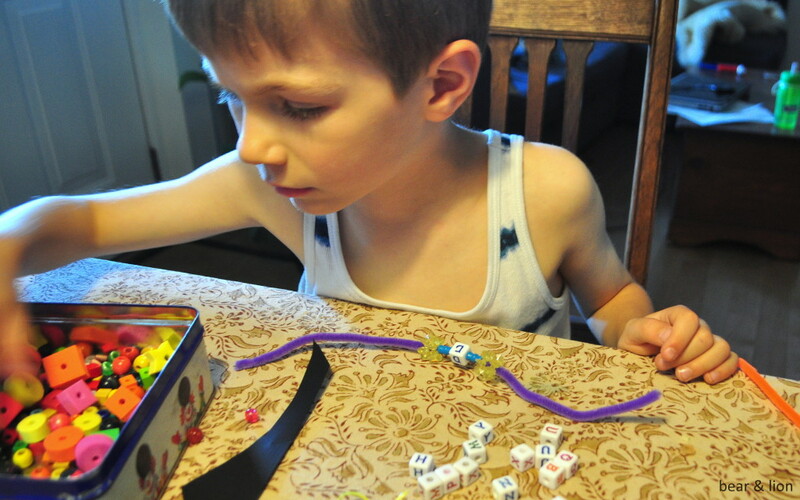 then with my hot glue gun i attached the lizards to the painted clothes pegs. 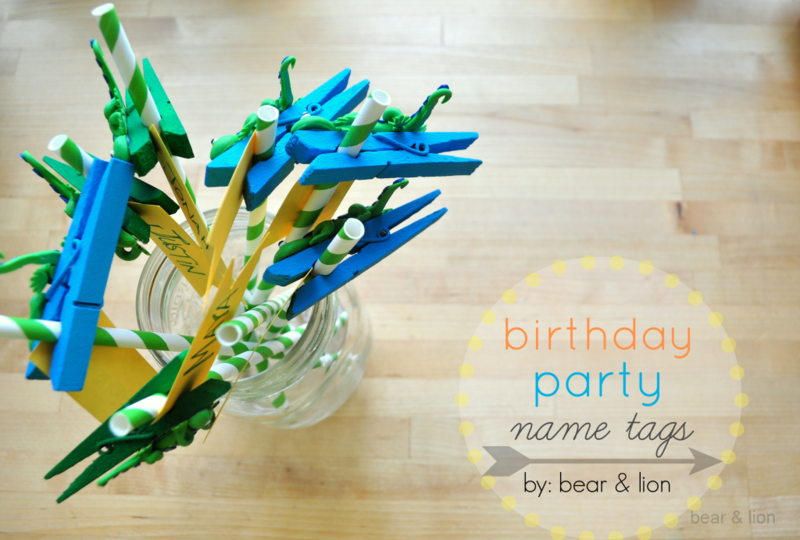 i then cut some cute flags out of card stock, wrote each child’s name on, got a paper straw and voila… DONE! i found the straws for $3 for a pack of 18 at michael’s. 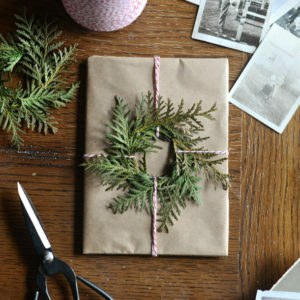 this is one of those crafts, where the impact is huge and process is so minimal! 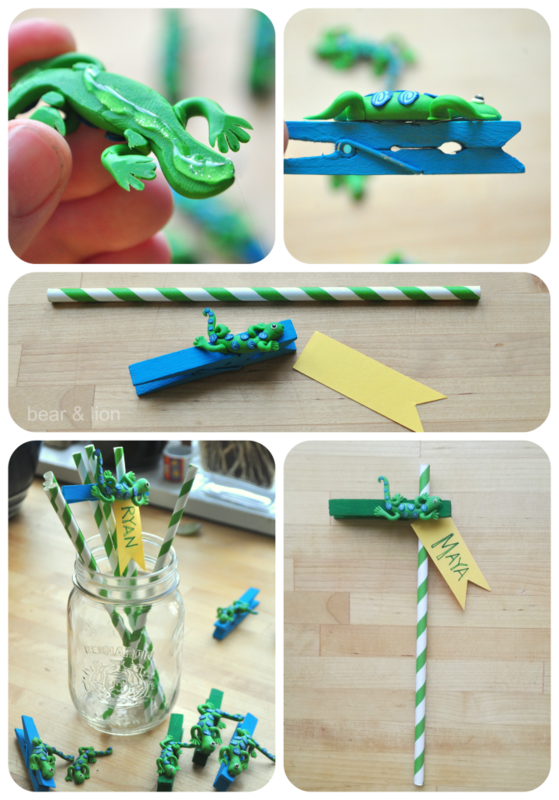 the kids can then take the lizard pegs home and use them to clip important pages together or whatever!